At least three people were stabbed in a brawl between KKK members and counter-protesters in California. A Ku Klux Klansman, left, uses an American flag to fend off angry counter protesters. DOZENS OF PROTESTERS who heard about a planned Ku Klux Klan rally were waiting by a Southern California park yesterday when six people pulled up in a black SUV. They were dressed in black shirts decorated with the Klan cross and Confederate flag patches and took out signs that read “White Lives Matter”. Witness video show the Klansmen were quickly surrounded Saturday afternoon by the counter-protesters who shouted at them. Someone smashed the SUV’s window. One KKK member stabbed a counter-protester with the decorative end of a flag pole, setting off a vicious brawl where three people were stabbed, one critically, and two were assaulted. “I got stabbed,” a man is then heard screaming, lifting his T-shirt to show a wound to his stomach. 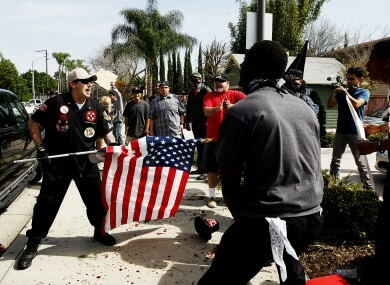 One police sergeant saw another Klan member with a knife in his hand and a counter-protester bleeding nearby, Anaheim Police Sergeant Daron Wyatt said. The sergeant took the KKK member into custody. Meanwhile, counter-protesters stomped on two KKK members, he said. “All hell broke loose,” said Brian Levin of California State University, San Bernardino’s Center for the Study of Hate and Extremism, who witnessed the violence. I thought they were going to stomp these Klansmen to death. Anaheim police had notified the public about the planned KKK protest Friday at Pearson Park, about three miles from Disneyland, and said they would be monitoring the situation for any violations of law. The department also said that while the group’s signs and fliers might be provocative, they are protected by the First Amendment. Police Chief Raul Quezada defended the way his department handled the situation, saying a contingent of officers were dedicated to the KKK rally and counter protest and they were able to arrest all of the main participants in the clash. “If we’re attacked, we will attack back,” said Barker, who did not attend the rally and spoke by phone from North Carolina. Last year, the group drew headlines when it protested the removal of the Confederate flag from the South Carolina Capitol. Those taken into custody were four Klansmen, who were booked for investigation of assault with a deadly weapon, and three counter-protesters on suspicion of stomping on an elderly Klan member. Police were looking for a counter-protester wanted on suspicion of assault. In January 2015, packets containing fliers condemning Rev Martin Luther King Jr and supporting the Ku Klux Klan were left in the driveways of about 40 homes in Santa Ana, about eight miles south of Anaheim. The fliers opened with the heading “On Martin Luther King Day, you are celebrating a communist pervert”. The bottom of the fliers stated they came from the “Loyal White Knights of the Ku Klux Klan”. The number of active KKK groups in the US increased to 190 in 2015 after falling in 2013 and 2014, according to the Southern Poverty Law Center, which tracks hate groups. Email “'All hell breaks loose' as protesters clash with Ku Klux Klan at rally”. Feedback on “'All hell breaks loose' as protesters clash with Ku Klux Klan at rally”.